STF: The Lost Issues Patron Marc Bryant suggested a Short Round / Chewbacca team up, as they were both partnered with Harrison Ford characters. There wasn't a lot of Short Round images to choose from, so I figured why not pair up Han and Indy themselves? Thanks for the support and inspiration, Marc! Harrison Ford is looking to reprise his roles as Indiana Jones and Rick Deckard in upcoming films, and after seeing him have so much fun as Han Solo again, I look forward to seeing him revisit two of his other iconic characters. I think that this is cool, pairing up characters portrayed by the same actor. You did the same not long ago in a tribute to David Bowie. I wondered, after that, if it might be a good pairing to put Mr. Spock with Paris from Mission Impossible, since Leonard Nimoy portrayed both of those characters. Great cover. How does one go about requesting a cover? I'd really like to see Amanda Waller (pre-New 52) go up against Nick Fury (Ultimate Universe). Nice use of angle and perspective on this one, Ross; it couldn't have been easy to find the images to fit in this so nicely, and almost seamlessly -- only the lighting angles seem "off." As for great Harrison Ford roles, as much as I love him as Indy and Han, I've generally felt that his most compelling role (of those I've actually seen) has been as President James Marshall in "Air Force One." I doubt that there'd be any way for him to reprise that role these days. On the topic of characters portrayed by the same actor, how about a meeting between Mark Hamill's two best, both of which are also being reprised this decade? Of course I'm referring to Luke Skywalker and the Joker. Han Solo: "My own kid stabbed me with a lightsaber." Indiana Jones: "It could be worse. At least your kid isn't Shia Labeouf." Indy: "So if you're dead, how did you get here?" Han: "Crazy old wizard I once knew owed me a favor." The front door opens and Deckard walks in looking exhausted. Sits down next to Solo and Jones. Han: Hey pal. What's your story?" Looking forward to the Fury/Waller meeting. The only thing more intense would be Fury, Waller, and Kevin Conroy's Batman in a staring contest. Very cool! 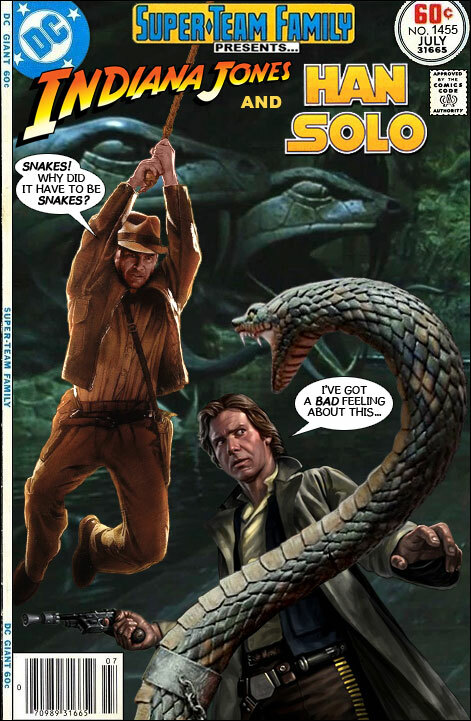 Wasn't there a Dark Horse Star Wars comic where Indy found Han's remains somewhere in the Pacific Northwest? It's not just any snake, guys. It's a Dark Lord of the Slith! Fangs for that comment. Got any adders? ENOUGH IS ENOUGH! I HAVE HAD IT WITH THESE OEDIPUS-IMITATING SNAKE PUNS ON THIS OEDIPUS-IMITATING BLOG!!! What does Oedipus have to do with anything? Off-topic, but a request: any two/all of Jughead Jones, Shaggy and Scooby, Homer Simpson, and Matter-Eater Lad in a team-up -- possible? "Off-topic, but a request: any two/all of Jughead Jones, Shaggy and Scooby, Homer Simpson, and Matter-Eater Lad in a team-up -- possible?" Jugghead (as 'Captain Hero') met Scooby -- as well as J. Wellington Wimpy, Superman, and the Hulk -- for a burger-eating contest in #350. You've done Han and Napoleon Solo already -- so how about Indiana, Jessica, and John Jones? Other teams would have trouble keeping up with that one! That was Kid Charlemagne's way of referring to SNAKES ON A PLANE. The now cult-classic film which starred a two-eyed Samuel L. Jackson as a DEA agent protecting a Federal witness from the genetically-enhanced ophidian life forms that had been smuggled on board the same Honolulu-to-L.A. flight. Thanks for the information! If I ever get married, to Princess Python, I'll name our first bouncing baby boa after you. I was trying to avoid NSFW language. Blue Beetle Vs. Spider-Man in "Bug Off!" Mars Attacks Howard the Duck! Robo Force in "Victory has a Price!"